NorthEast United rallied to play out a thrilling 1-1 draw with Delhi Dynamos, playing their first home match of the season, to remain on top of the table in the Indian Super League (ISL) in New Delhi on 15 October. Kean Lewis put Delhi ahead in the 38th minute but Uruguayan striker Emiliano Alfaro cancelled it out in the 51st minute as more than 27,000 crowd witnessed a high-voltage and quality encounter at the Jawaharlal Nehru stadium. NorthEast remained on top with 10 points from five matches -- three wins, a draw and a loss -- while Delhi jumped to third spot with five points from three games. Delhi remained unbeaten with a win and two draws so far. Both sides started the match slowly, trying to build the tempo and looking to break down the opposition citadel. NorthEast looked likely the side to get the openings initially with better distribution of the ball. The trio of Alfaro, Nicolas Velez and Katsumi Yusa looked dangerous at times while nippy Holicharan Nazary made some fine runs at the right flank. But it was Delhi who got the first chance to take the lead, only to be wasted. Just after the away team supporters 'booed' the referee for showing yellow card on Yusa for 'diving' inside the area, NorthEast goalkeeper Subrata Paul could not collect properly a harmless looking shot from Milan Singh but Kean Lewis also shot straight to the keeper off the rebound. Yusa then had his low shot from an angle beat the goalkeeper but saw it go wide in the 25th minute. 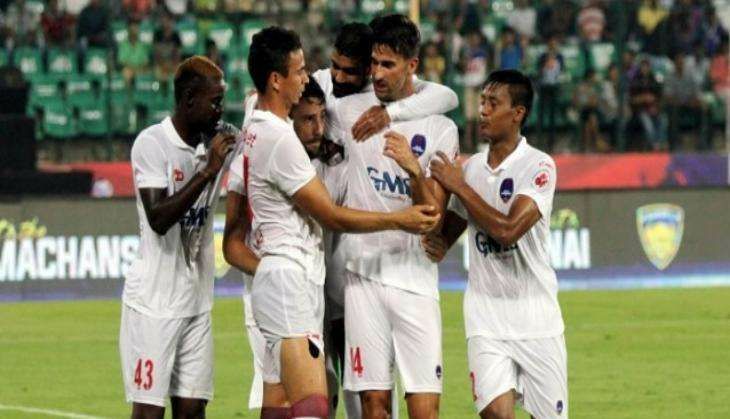 But next minute, Alfaro failed to punish Delhi from a defensive blunder committed by Ruben Gonzalez Rocha. Velez intercepted a horrible pass by Rocha to his goalkeeper Antonio Doblas. Instead of taking the shot himself, Velez passed the ball to Alfaro, but the Uruguayan striker shot wide in front of an empty net. Delhi took the lead off a set piece in the 38th minute, with NorthEast keeper committing a blunder. Marcelo's corner saw Paul come off his line and completely miss the flight of the ball. The ball fell for Lewis at the far post, who slammed it into the far corner of the net with his second touch. The intensity of the match did not drop in the second half with end-to-end attacking from both sides and it was difficult to differentiate between the two sides. To the disappointment of their home fans who matched NorthEast fans in lung power throughout the match, Delhi conceded the equaliser in the 51st minute with Real Madrid defender Rocha committing a blunder for the second time in the match. READ NEXT >> Una victims in RSS camp: how will it impact the Dalit movement and UP polls?